What in the heck is a garlic scape? It sounds like it’s fleeing…that can’t be good. If you didn’t know, a garlic scape is the top sprout of a bulb of garlic. Whaaaat? Garlic has a top part? 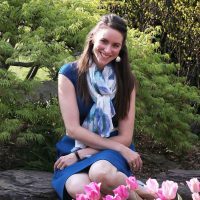 There’s more than just a smelly, papery bulb? As I puzzled over what to make with the long, curly scapes, I just kept hitting on salad dressing. 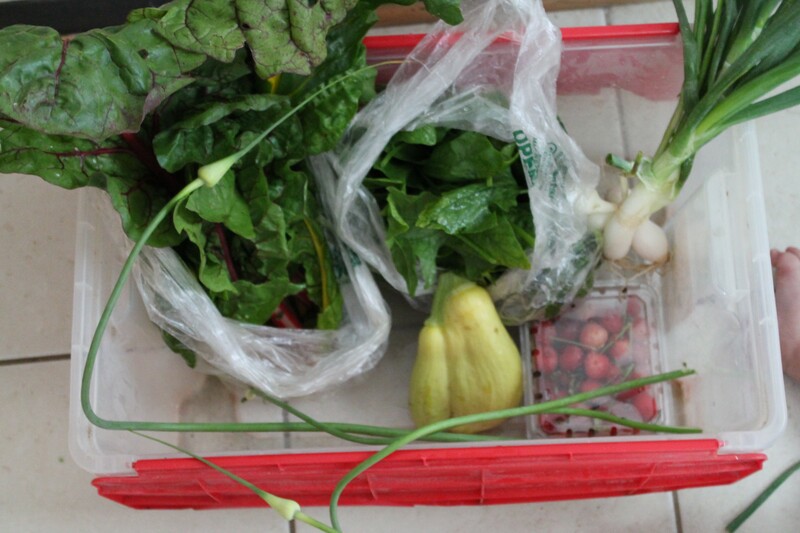 After all, my week 3 box also included about half a pound of loose leaf greens, a nifty mutant squash, and a large bundle of spring onions (oh, and some Swiss chard and sour cherries). The perfect makings of a salad (and a side dish and a tart)! I looked and looked for a recipe for a salad dressing that highlighted garlic scapes, but nothing really called out to me, so I did what I have come to enjoy doing quite a lot: I wung it. (Yes, I did just make up a word.) And then I gobbled up the results and practically licked my salad bowl. You should stop by a farmer’s market and grab some garlic scapes to make your own tangy vinaigrette! I promise you’ll like it. First of all, let’s toss a quick salad together. I pulled the stems off about 5-6 large handfuls (6 oz. or so) of small, loose leaf lettuce. Loose leaf lettuce is any lettuce that doesn’t grow together as a head, the way iceberg and romaine do. 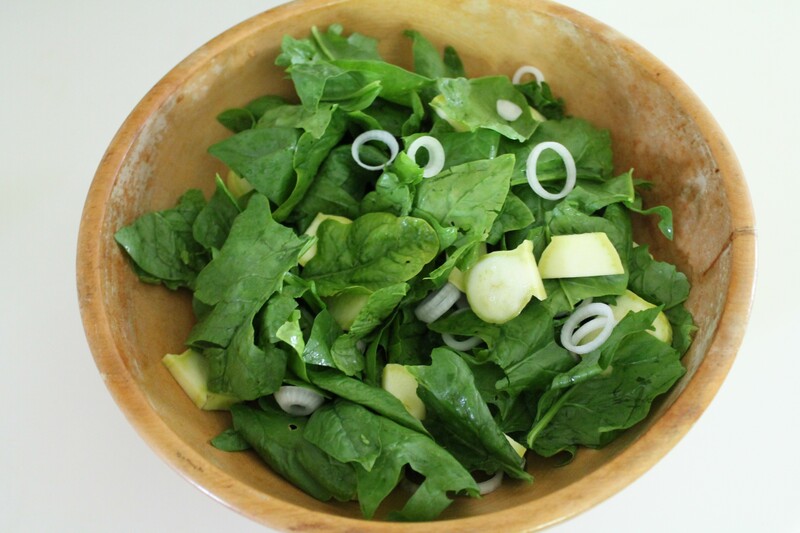 Some pretty common loose leaf greens include mesclun, arugula, and even spinach! The greens that came in my CSA box were a bit mysterious to me, though. They were fairly small, though I am not sure they could be considered baby greens, and they were shaped a little like arrowheads. They tasted earthy, grassy, and slightly peppery, like arugula, but to be honest,I have no idea what they are. All I know is that they made a delightful salad! Feel free to use any loose leaf greens that you really like here. If there are any long, tough stems, pull them off. Tear any very large leaves into smaller pieces. Now thinly slice a medium zucchini or yellow crookneck squash. As you can see…I had a mutant twin squash! It looks like it can’t decide whether it wants to be green or yellow. 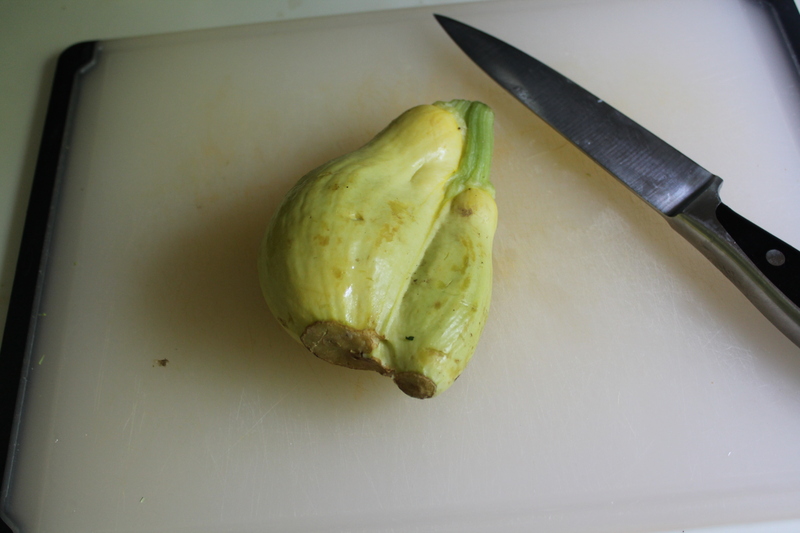 It tasted fairly similar to a zucchini, with very firm flesh and not too many seeds. I just separated the twins and sliced them up! 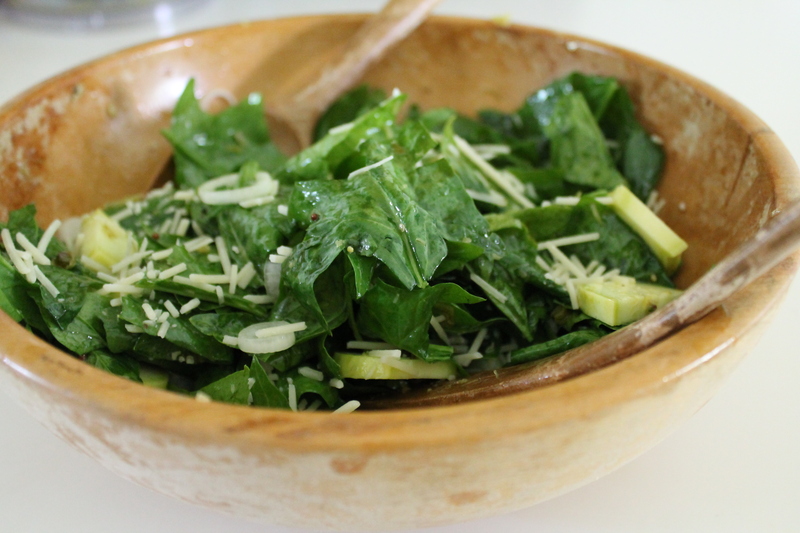 Toss your veggies together and set the salad bowl aside while you make a killer warm dressing! I used my scapes in two different ways, but I suspect this dressing would have been just as delicious if I had just picked one way, either one, and done only that. You can cut corners if you are short on time! But here’s what I did. I trimmed the bottoms and very tops off of three scapes. Then I cut two of them into 1″ segments and I small-diced the third. The longer scape pieces went into my food processor with white wine vinegar, whole-grain Dijon mustard, honey, a squirt of lemon juice, and olive oil. 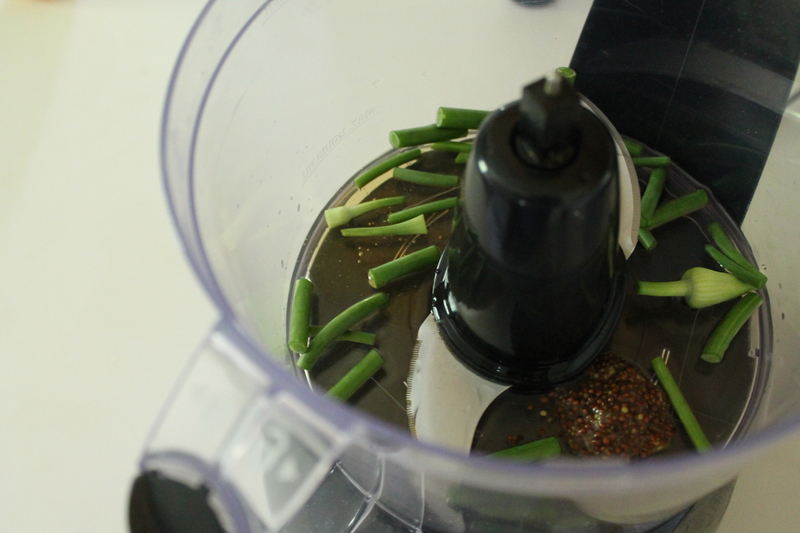 I pureed until the scapes were cut up into small slivers. 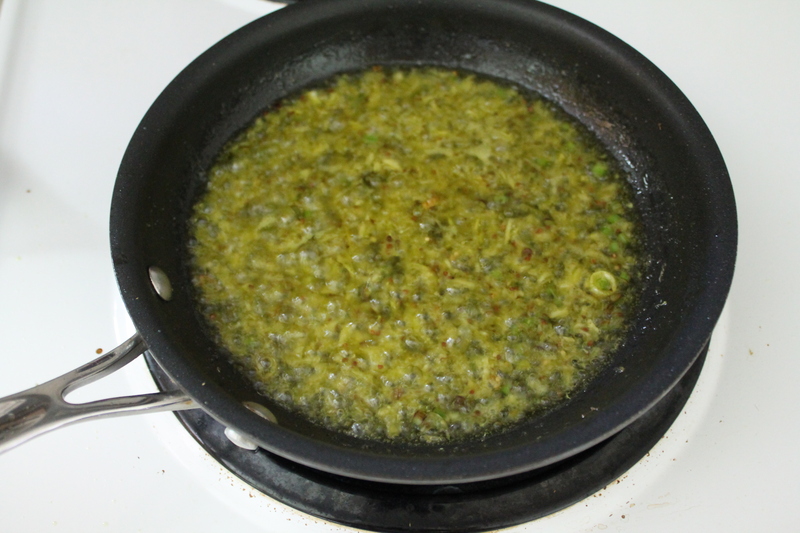 Then I tossed the diced scapes into a sauté pan with a little bit of warm olive oil. I sautéed until they were fragrant and bright green. And then, the exciting part! I poured the dressing into the pan with the scapes that were already cooking. It sizzled and fizzled and immediately began to release a very intense vinegar aroma. But this was important, because we used so much vinegar in the dressing. I’ll be the first to admit I love the sharp bite of vinegary…but in this case, heating the vinegar cooked off some of the sting and sweetened it up just enough that you won’t wince when you taste it. Let the vinaigrette cook down for about 2 minutes to help the stronger flavors of the vinegar and scapes mellow. 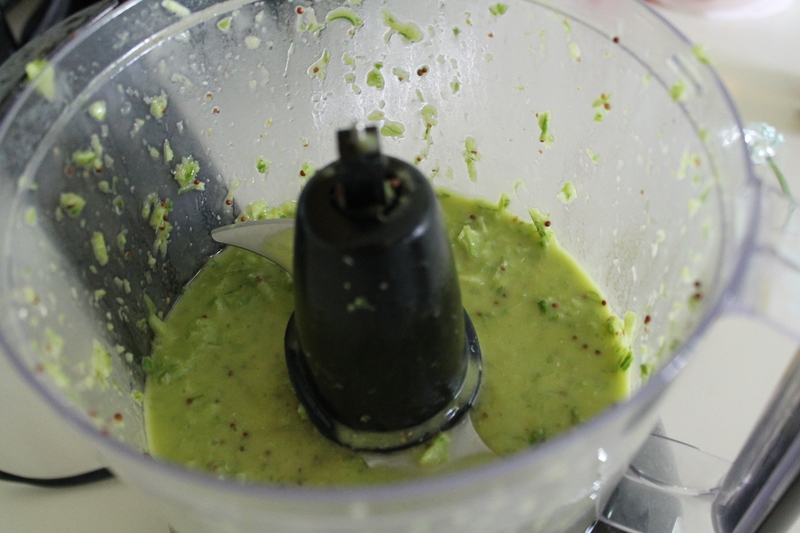 I decided to pulse it in the food processor quickly as soon as I removed it from the heat, just to mix the ingredients a little more thoroughly—but work quickly, because we want the dressing to be warm when it hits the greens! Toss the warm vinaigrette with the salad you prepared. Make sure everything is well combined, then sprinkle with fresh grated or shaven parmesan. Delicious! Rinse the lettuce and roughly tear up any very large leaves. Slice the squash and onions and combine with the lettuce. Add in the oregano, if using, and toss the salad gently. Set aside. 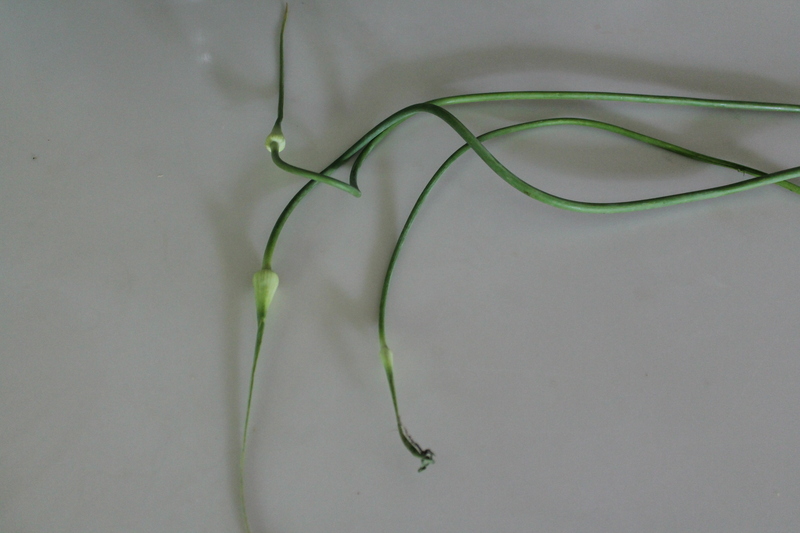 Cut 2 garlic scapes into 1″ lengths. Place in the bowl of a food processor with vinegar, 5 tbsp. olive oil, mustard, honey, and lemon juice. Pulse until the scapes are uniform in size and the liquids are completely combined. Season very lightly with salt and black pepper. Thinly slice the third garlic scape. Heat the remaining 1 tbsp. oil in a small pan over medium heat. 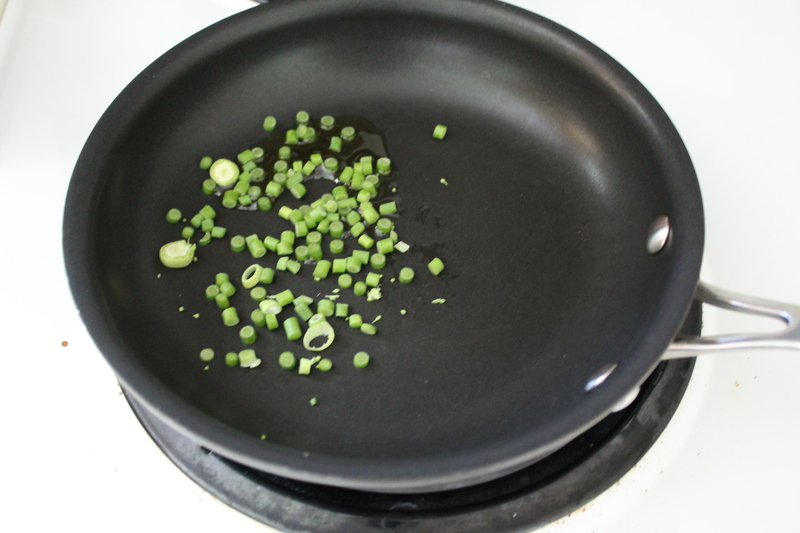 Sauté the sliced scape until the pieces are slightly softened and bright green. Add the dressing to the pan and let it sizzle, whisking constantly, for about 2 minutes. Remove from the heat and whisk another 15 seconds or so to recombine all the liquids. While the vinaigrette is still warm, toss with the salad. 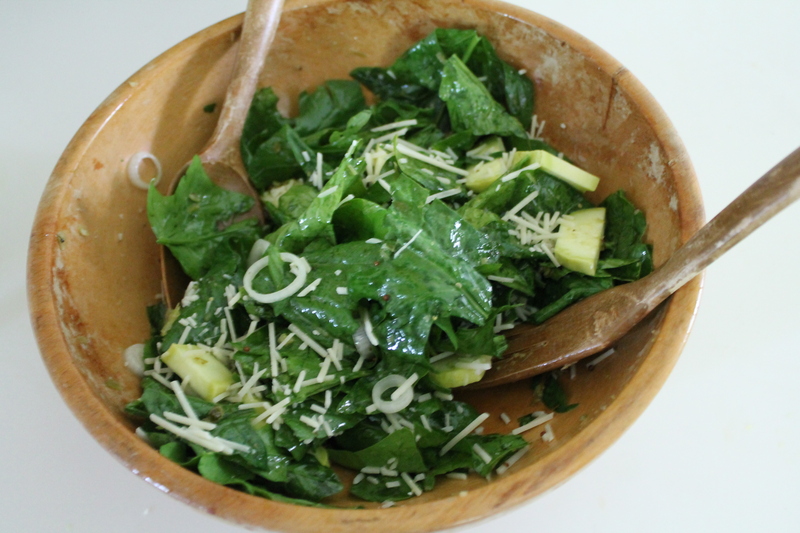 Top the salad with parmesan. Serve immediately. I just discovered garlic scapes, too! I love them!